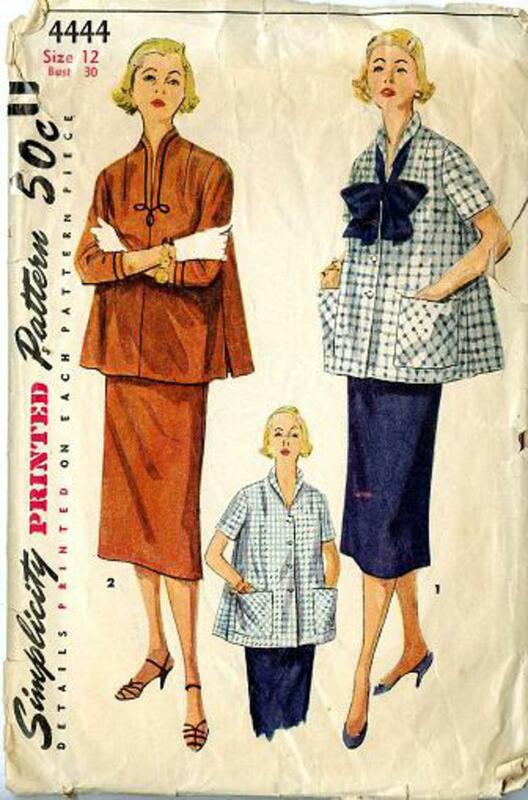 1953 Simplicity #4444 vintage sewing pattern, misses' maternity two-piece suit, size 12. Top has set-in sleeves and collar cut in one with front. V. 1 has short sleeves, patch pockets, front button closing and bow trim. V. 2 has slit openings at side. Stand collar and three-quarter sleeves have braid trim. Skirt has low cut front, pleat at center back, adjustable waistband is of cotton twill tape or ribbon. Skirt is adjustable.